Dude, I don't even know what I'm doing. Just mix it all together! Fill greased muffin tins about half-full, then bake at 350 degrees for 18-20 minutes. These spoil within a few days, so eat ’em up, or keep ’em in the fridge! Again, I normally don’t like gluten-free pastries and breads, but these are pretty good! When I first started making them, they were always gross and dry, but the addition of an egg and some more oil really helped make the nice and cakey. You can make these with mashed carrot, grated zucchini, applesauce, or probably any number of fruit or vegetable. You might want to add some golden raisins or nuts to this as well. Put the bananas and apple in a food processor and blend until smooth. Add the rest of the ingredients and blend until smooth. I mean, or you could pour the fruit into a bowl, and sift in the dry ingredients, mix the rest of the stuff in, but I’m too lazy to dirty another bowl, and it all fits in the food processor, so why not? Pour into a greased cake pan and bake at 350 degrees for 50 minutes to an hour, until a toothpick comes out clean when you stick it in the middle. I’m normally not into gluten-free sweets or pastries. They always turn out bland, dry, and crumbly. However, this recipe is actually quite moist and springy, like the real thing! I think it’s all the eggs. 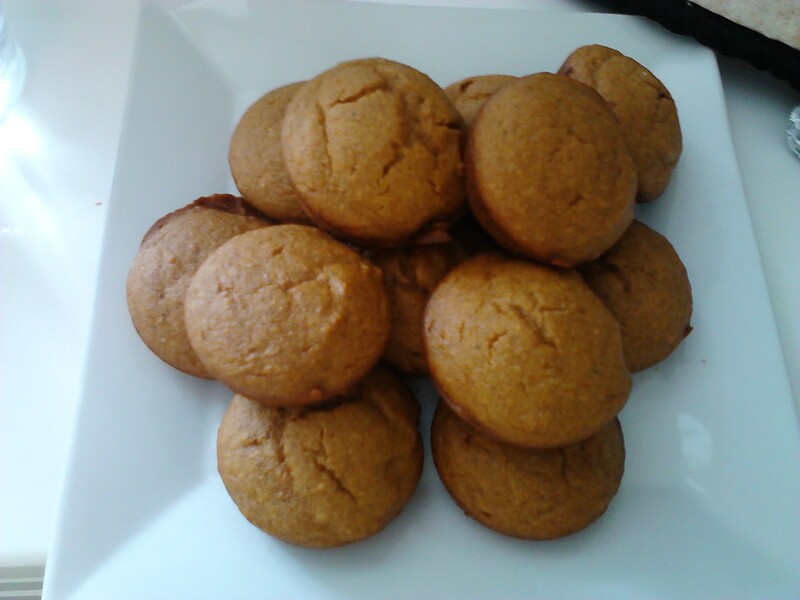 I’m sure if you made this recipe with wheat flour, sugar, and butter, it’d be delicious, too, but if you’re celiac or just trying to avoid foods with a high glycemic index, try this out! You could totally add walnuts or pecans, too, for extra flavor. Peel 3 of the apples. Core them and slice them thinly. Arrange them on a baking sheet and top with honey and spices. Bake at 350 for 20-30 minutes or until soft but not too browned. Allow to cool completely before handling. Meanwhile, crush the nuts a bit. Blend in a food processor with the 1 c of cranberries until it forms a sticky ball. In a greased cake pan, press the mixture evenly over the bottom, like a cheesecake crust. Cut up the other 3 apples (no real need to peel them, unless you’re opposed to tiny bits of peel in your pie) and process them with the rest of the cranberries and the spices. Pour the applesauce over the crust, then artfully (so, so artfully!) 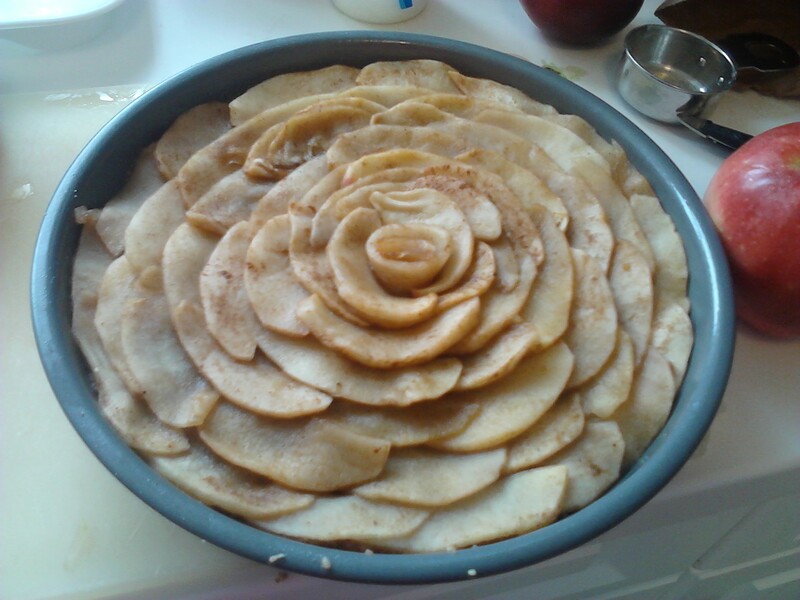 arrange the cooked apple slices over the top. Refrigerate, or even freeze, before serving. Melt the butter and let it come back to room temperature. (I use the defrost setting of my microwave to do this.) Bring out your big ol stand mixer (You can do it by hand, but the texture will be more pound cake-y and less fluffy.) and beat the eggs and molasses until well combined. Add in the sugar and beat until it’s super-fluffy and has at least doubled in volume. Add in the spices and give it a quick mix until incorporated. Sift and add the flour in three parts, stopping to scrape down the sides of the bowl when you need to. Switch to a spatula and slowly add in the butter. Try to mix slowly so you don’t deflate the batter too much. 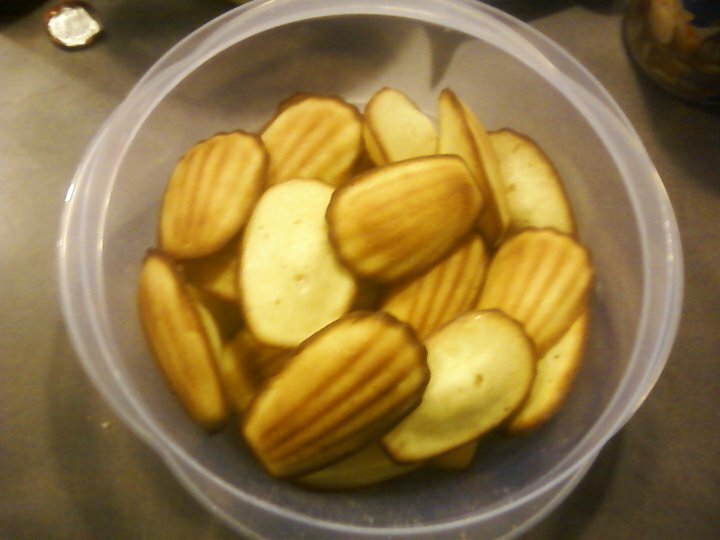 Cook in well-greased madeleine molds for about 9-10 minutes at 375. 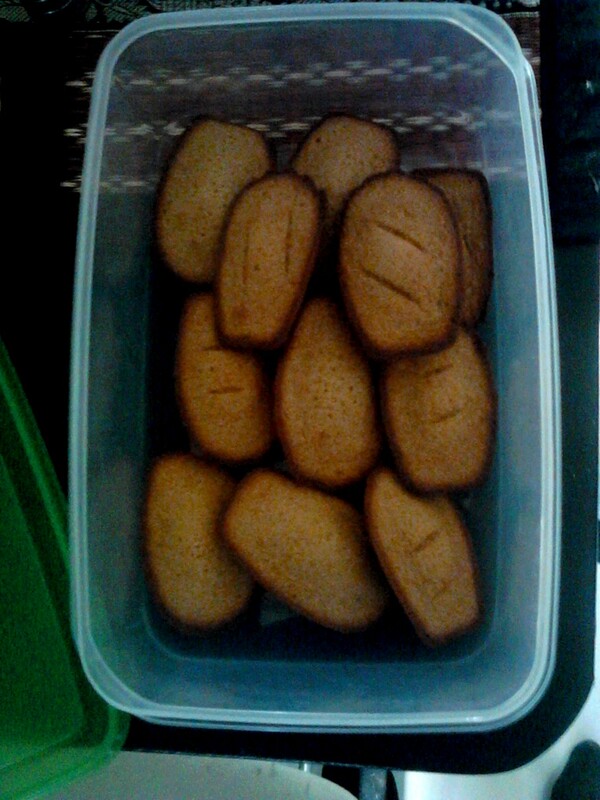 Makes about 30 average-sized madeleines. You can dust them with powdered sugar, if you like. 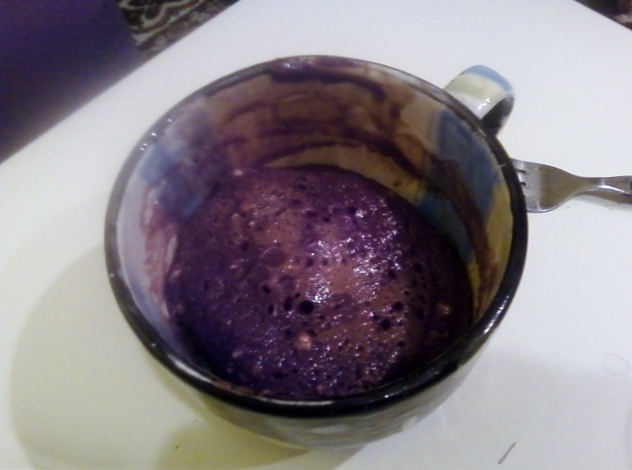 Thoroughly mix the egg, milk, chocolate syrup, and Nutella in a big, microwave-safe mug. Add flour. Add enough sugar to make the brownie as sweet as you like. Drop a mini candy bar in the middle if you like. Microwave for 2 minutes. You might need to alter the time, depending on your microwave. 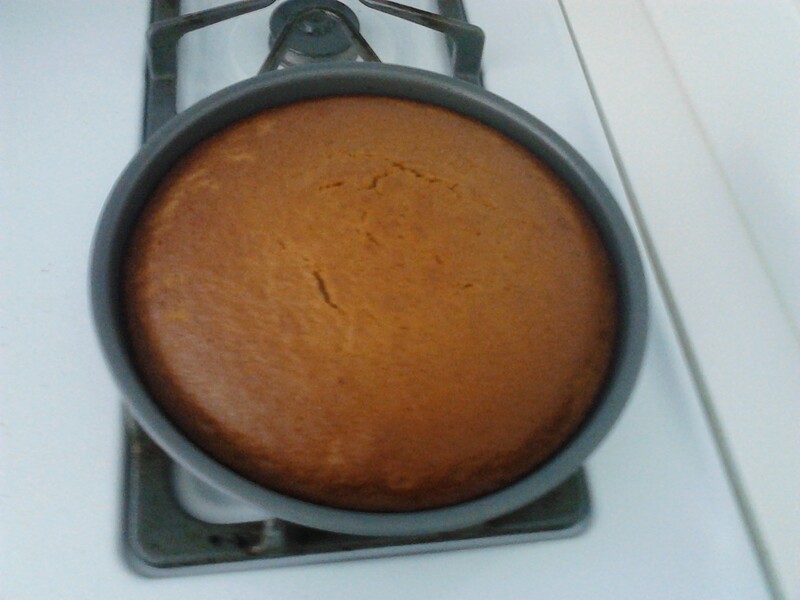 Let it cool for a couple of minutes before eating. This is not fancy at all, but if it’s midnight on Friday, you’ve been drinking, and you’re craving a brownie, it’ll do. Preheat oven to 350 and cook the pie shell for 10 minutes or so. Melt butter and cool to room temperature. Mix eggs, sugar, vanilla, and vinegar with a stand mixer. If you don’t have a stand mixer, just whisk for a while, but it’s going to take a long time to get a light, fluffy batter. Slowly add melted butter and pour into the pie shell. Bake at 300 degrees for about 15 minutes, then bake for 45 minutes at 350** or until a crispy crust sets and turns almost the color of the pie shell. 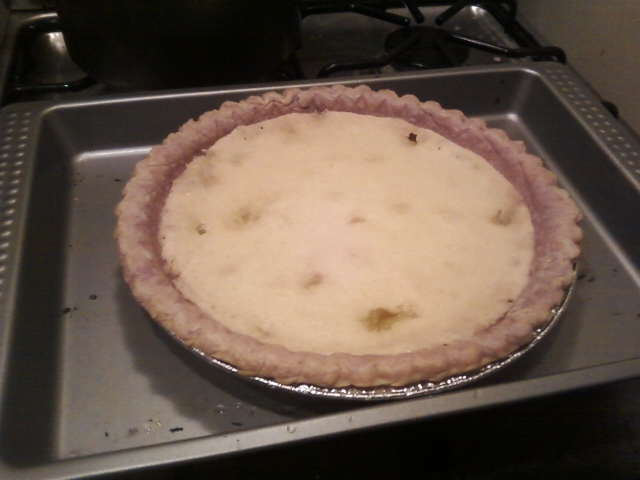 Allow to cool completely in the oven (or your pretty crust will crack, as mine has in the above photo) and refrigerate. Serve cold and with canned whipped cream, because we Southerners keep it classy. *A regular-depth pie crust works as well. It looks prettier, too, but it can spill out if you’re not careful, so I go with deep-dish. ** If you cook it at 350 the whole way through, it rises quickly and forms a tall crust, then it sinks back down and you get this weird space between the crust and the custard-y part. Cooking it low at first means the crust will be more likely to stick to the custard, but it’s no guarantee. It’s hard to make this look super-pretty, but either way, it will be tasty. A few words on this recipe: Chess pie is one of those stereotypical Southern things that no one outside the South seems to have any clue about. It’s very rich and sweet (like most Southern dessert items) and has a kind of custard-y texture. I got the recipe from my grandmother, who got it from Mrs. Storey, who once hosted dinner for my grandparents and father when they moved to a little town called Signal Mountain, TN. My father liked the chess pie she made for dessert so much that my grandmother asked for her recipe, and my family’s been making it ever since. Some traditional recipes add a little cornmeal, which is fine. Some other recipes will tell you to add flour or omit the vinegar for citrus fruit and zest, which is wrong. Don’t try to fancy this up, and you’ll have a very delicious Southern pie. Really, I normally don’t have so much pride for my Southern roots. I left Georgia because it kind of sucked. However, when it comes to the food, don’t even play. It’s the best around, and you know it. Cream butter and sugar. Add eggs and lime juice and blend well. Add flour, baking powder, and salt and mix. The dough will be very sticky, so chill dough for an hour or two (I froze mine for an hour). Preheat oven to 350 and bake for 10 minutes or until bottoms begin to brown. Feel free to dust them with powdered sugar, but I found them sweet enough as-is. Beat eggs, vanilla, lemon juice, and salt on high for 10-15 minutes. Slowly add sugar and mix quickly. Fold in flour in 4 turns. Pour butter around the sides of the bowl and mix briefly. Pour into madeleine pans and bake at 375 for 12 minutes. *lemon is the more traditional option here, but I love the way the orange zest perfumes up the cakes. Choose either, or do half lemon and half orange. Haven’t tried it with lime zest . . .
UPDATE: deliciously tropical with lime zest. Cream butter and sugar. Add the egg, water and molasses. Sift in dry ingredients (save 2 tbsp sugar) and mix well. Preheat oven to 350. Roll walnut-sized balls and dip them into the sugar. Place on ungreased cookie sheet, sugar side up, and flatten them slightly with the back of a fork. Bake 10 minutes (cookies should be a little deflated) and let cool on a wire rack. 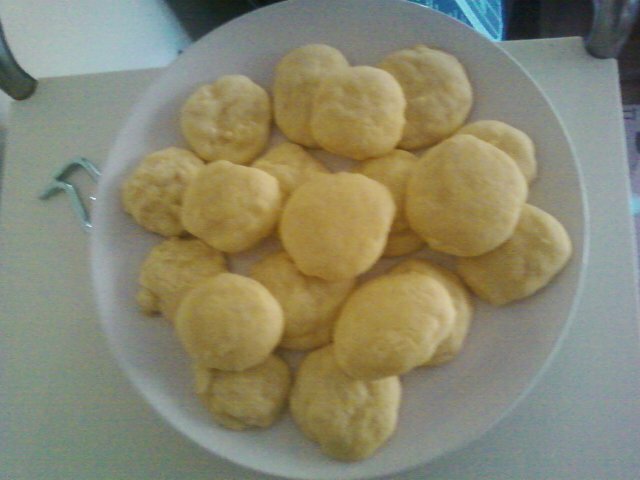 UPDATE: These cookies are pretty fluffy and biscuit-y. 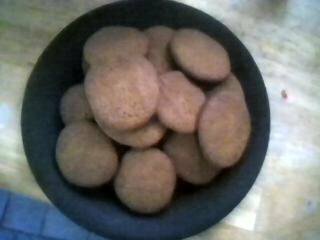 If you want more ginger snappy cookies, omit the eggs. I ran out of eggs today, and I thought they’d be ruined, but they turned out to just spread more and get delightfully crispy. You might have to cook them a minute or two longer if you go that route. NON-RECIPE: Look at my garden!